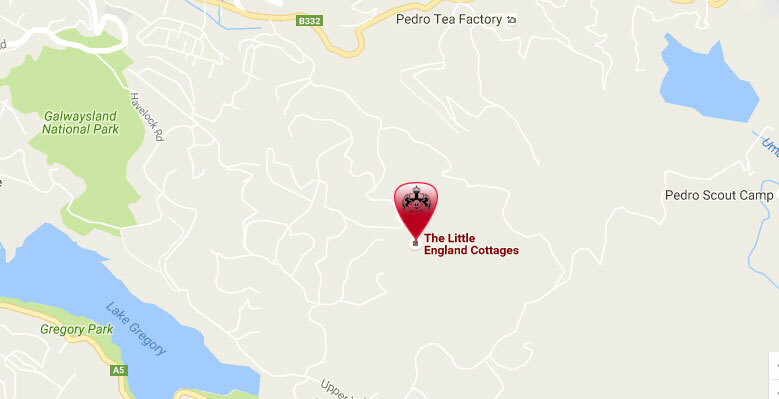 Little England Cottages are located on what used to be part of the Pedro Tea Estate in an area within the Nuwara Eliya municipality traditionally known as Moon Plains. The complex is surrounded by a protected forest, the tea gardens of Pedro Estate and by neatly cultivated vegetable farmland. The neighboring scenery is dominated by Sri Lanka’s highest mountain range, Mount Pidurutalagala at 8,281 feet (2,524m) above sea level with its majestic ‘Lovers Leap’ waterfall. Nuwara Eliya, Sri Lanka’s premium hill country station and former colonial health resort, benefits from a temperate climate of brisk sunny days, cooler nights and seasonal rains and is surrounded by verdant scenery of forests and tea gardens. It’s 6,199 feet (1,889m) above sea level, 105 miles (170km) from Colombo.